Iceland is one of the world’s most beautiful travel destinations. The Northern Lights is one of the most amazing natural phenomena to photograph. Combine both, and you get an epic photo. Combine both with the Kerið volcanic crater lake, and you’ll no longer have words to describe the beauty. 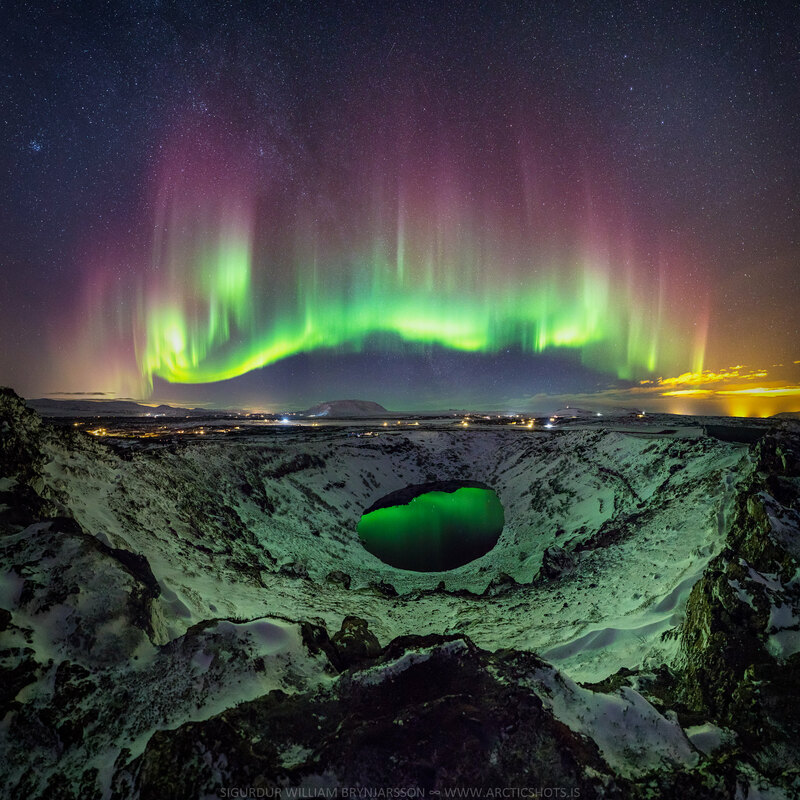 Some two weeks ago, Icelandic photographer Sigurður William took a night-time hike up the Tjarnarhólar volcanic hills to capture the Northern Lights. When he made it to the top of the caldera, he noticed they reflected in the 3,000-year-old central lake. He captured a 13-frame panoramic mosaic which shows rarely seen colors and impressive banding. The background, as shown by Astronomy Picture of the Day (see below) is filled with icons of the northern night including Polaris, the Pleiades star cluster, and the stars that compose the handle of the Big Dipper. To see more of Sigurður William’s epic Northern Lights photography, head on over to his Flickr-page. He’s also a tour guide for ArcticShots.is.